Recently, we posted about a personal connection that Archaeologist Alycia Giedd made with northwest Indiana history. 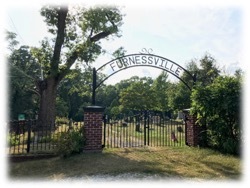 She discovered we were working near a small town where her ancestors used to live (Furnessville, Indiana). Alycia learned that a handful of her ancestors, including her 4x great grandparents, were buried in the cemetery associated with this town. Once she realized her connection with the town, she used her knowledge of uncovering the past to delve a little bit deeper in to her family’s history. That social media post generated quite a bit of activity, so we decided to share with you some of the tools we use during our research and how you can use them to research your own family history. Because digging for the past doesn’t have to be done outside in the dirt, you can do it right from your fingertips on the computer. We use several websites for historic research. Each have strengths and weaknesses, but there is no single “best” site. It all depends on your needs and interests. That said, many sites are very good – click on the link here for a PDF with more info on just a few of our favorites.